The presentation, titled “Engineered Silica Particles Work as a Molecular Sieve and Reduce Metabolic Risk Factors in Obese Male Volunteers”, will highlight SiPore15TM’s mode of action and First-in-Man clinical data. The presentation will be given by Dr. Maria Lindgren, Head of Clinical Development at Sigrid Therapeutics, in the category 12-F Clinical Therapeutics/New Technology–Other Therapeutic Agents. 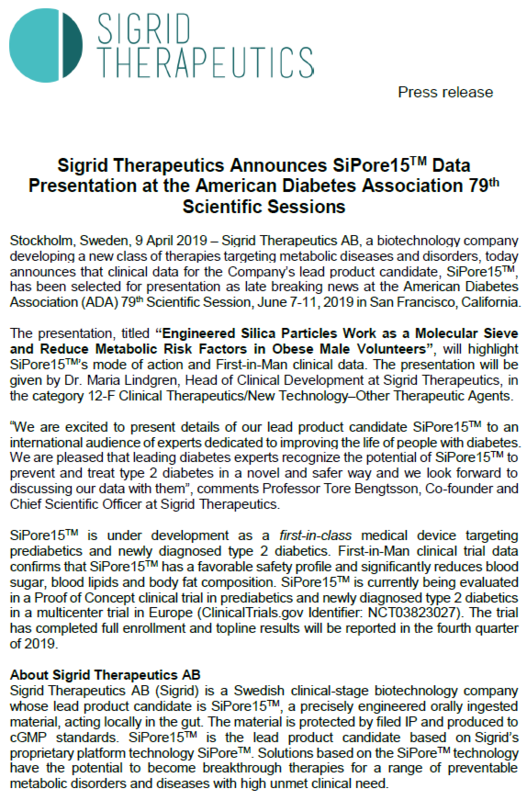 “We are excited to present details of our lead product candidate SiPore15TM to an international audience of experts dedicated to improving the life of people with diabetes. We are pleased that leading diabetes experts recognize the potential of SiPore15TM to prevent and treat type 2 diabetes in a novel and safer way and we look forward to discussing our data with them”, comments Professor Tore Bengtsson, Co-founder and Chief Scientific Officer at Sigrid Therapeutics. SiPore15TM is under development as a first-in-class medical device targeting prediabetics and newly diagnosed type 2 diabetics. First-in-Man clinical trial data confirms that SiPore15TM has a favorable safety profile and significantly reduces blood sugar, blood lipids and body fat composition. SiPore15TM is currently being evaluated in a Proof of Concept clinical trial in prediabetics and newly diagnosed type 2 diabetics in a multicenter trial in Europe (ClinicalTrials.gov Identifier: NCT03823027). The trial has completed full enrollment and topline results will be reported in the fourth quarter of 2019. Sigrid Therapeutics AB (Sigrid) is a Swedish clinical-stage biotechnology company whose lead product candidate is SiPore15TM, a precisely engineered orally ingested material, acting locally in the gut. The material is protected by filed IP and produced to cGMP standards. SiPore15TM is the lead product candidate based on Sigrid’s proprietary platform technology SiPoreTM. Solutions based on the SiPoreTM technology have the potential to become breakthrough therapies for a range of preventable metabolic disorders and diseases with high unmet clinical need.